During the bee keeping season (March to November) you need to do weekly inspections. The purpose of inspecting your hives is to keep them healthy and strong by heading off problems as early as possible before they become a big deal. And especially to avoid colony failures – dead outs. Upon examination of a hive which has failed you might find that it is infested with hive beetle or wax moth larva, or that it is completely devoid of food stores. This might lead you to believe that those were the cause of the failure, but chances are that they were just the last of an unfortunate series of events which started much earlier – Which usually went undetected because the hive was not inspected regularly enough. Inspect only when the temperature is above 57 degrees. You can pop the top when it is cooler, but don’t remove frames or you may chill/kill brood. Inspecting in the middle of the day is best because many of the bees will be out foraging, and the reduced hive population will be less aggressive and easier to deal with. A hive which is disturbed after dusk/dark will be much more aggressive. Two major causes of colony failure – queenlessness, and malnutrition – are very preventable, even for a beginner, just by doing weekly inspections and being prepared to take action. Smoke at entrance – not too much just enough to make them smell it. Smoke at top – again, not too much. Remove end frame, examine, set aside. Pry all frames over together to make room to replace end frame. Remove top box with slight twisting motion to break loose from frames in bottom box. Set top box aside – lean against hive stand or place on top of inverted cover. As you replace everything keep in mind – never leave space between frames or the bees will fill it with comb. Proof of an actively laying Queen – this is really more important than anything else. If you keep your hives queenright and fed you will be doing better than 3 out of 4 new beekeepers. It’s great to see the queen, but not necessary. It can often be very hard to spot the queen even when she is right in front of you. As you can Imagine a queen might be difficult and time consuming to find in a strong hive. Don’t waste too much time looking for the queen – instead look for Eggs and young Brood. Eggs can be hard to spot on new white comb – black plastic or old foundation will make it a lot easier. The milky looking substance is royal jelly being fed to newly hatched larva. Eggs and newly hatched larva indicate that your queen was present and active within the last 3-4 days. That is good enough proof of an active queen. Just hatched larva like this can be hard to tell from eggs – which are about the same size – but the camera reveals that even very young larva are segmented – and surrounded by food. As larva age they get larger and curl into a circle. #2 is probably about 24-36 hours old. A weak hive can get robbed and lose both the queen and the ability to produce a new queen in the process – or simply gets robbed into starvation and fails generally. Prevent robbing by keeping entrances small, don’t open hives more than necessary, keep populations strong, use robber screens. If a hive becomes unpleasant enough for some reason (hive beetles, heat, starvation) the queen might abscond – that is leave with all of the workers which are able to go with her. An over abundance of food (often caused by feeding) can also cause a hive to eventually fail – because too much food is one of the things which can cause a hive to swarm – and possibly result in queenlessness. But if you do your inspections, then you probably will not overfeed your hives to the point of swarming. Make sure that there is plenty of food available – The goal is to have at least 15 pounds of honey at all times in each hive. A medium frame of capped honey holds about 3 1/3 pounds. Food which is on a frame along with other resources – like brood – counts toward the total. Bees also need plenty of open nectar for day to day use. If a hive does not have a good bit of open nectar in addition to capped honey – during the beekeeping season – then you need to feed syrup/sugar water. That is – Unless, there are honey supers on the hive with honey being produced – Never feed when supers are on during honey season which is about early April through Early June. But if there is a honey flow on – open nectar will not usually be short. Pollen is the high protein part of a honey bees diet – brood cannot be produced without pollen. However a hive also cannot live on pollen alone. Notice the bald brood in this picture – in this case it is probably just not quite completely capped, but lines or patches of bald brood can indicate the presence of wax moth larva. Large amounts of scattered bald brood may indicate disease or some other stress. Drone brood looks a lot like corn pops cereal. Queen cells are brood too. A strong hive has good population density and is more able to deal with robbing or hive beetles – and many other problems. Keeping a strong population density is a goal of good beekeeping. This hive looks just right for adding another box. This hive is too strong – too much population will make a hive start swarm prep. This hive needs an empty super to be added – even then it should be monitored for signs of swarm prep. Even though this is a small nucleus hive it still has a strong population of bees. Small hives can be strong and big hives can be weak. This is a weak hive – the picture was taken in late winter when populations are normally on the small side, but you always want to see more bees than this in the main part of a hive. When you first add empty boxes they will be weak until the bees build up into them, but supers should be removed from chronically weak hives so that the bees can better care for the smaller remaining space. Backfilling – backfilling is when nectar is stored in the brood nest. Backfilling the brood nest is one of the first signs of swarm prep during the Spring and Summer reproductive season. After September it is normal preparation for winter and not a sign of swarming. If you find backfilling you need to stop feeding – if you are feeding – and make sure the hive has enough room. You might even consider inserting a foundationless frame in the brood nest between two frames of brood – this will usually cause them to very quickly build a frame of comb which the queen almost always immediately lays eggs in. All of that will help to use up nectar and get them distracted from swarm prep for a while. 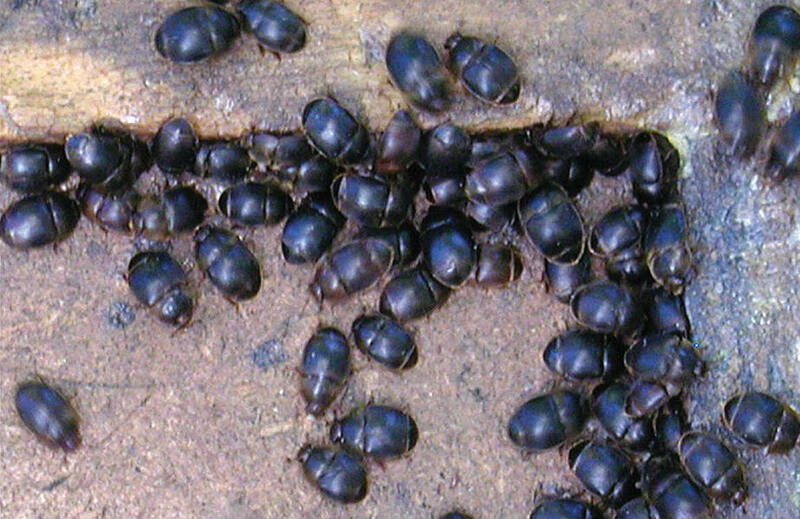 Adult beetles – not usually a problem. Beetle larvae – this is a problem. Wax moth damage – if you see webs it is wax moths. Wax moth larva are often present but strong hives can usually control them. I hive full of wax moth damage usually secumbed to something else. Bee feces on the front of the hive is evidence of nosema apis – mostly a problem in late winter/early spring when the bees are cooped up for long periods. Nosema Cerana does not express with streaking on the front of the hive. However both kinds of nosema cause slow build up, low feed consumption and bees crawling on the ground with “K” wings – the front set of wings sticking out abnormally. American Foul Brood – The most serious disease of honey bees. AFB is a bacterial disease which kills brood after it is capped – turning it into a rubbery snot like substance. AFB hives will smell like rotting meat, have very spotty dark colored brood with sunken or perforated irregular caps. If you think you might have AFB you MUST call the state apiary inspector immediately. THOU SHALL NOT try to deal with it on your own. Fortunately it is not very common. European Foul Brood – much less serious than American Foul Brood – kills brood before it is capped. Symptoms are yellow/brown off colored open brood (should be nice and white) larva which are misshapen, twisted or lying on the bottom of the cell. AFB is a stress related bacterial disease which often clears up on it’s own once a good nectar flow starts. Therapies include antibiotics, requeening, and feeding lots of syrup. Once you have finished your inspection put everything back together and consider making a few notes. If you are inspecting a big hive unstack it down to the bottom box first and then begin your inspection at the bottom – otherwise you will be pushing bees down as you go and you will end up having to inspect the bottom of the hive with many many bees in the way. Be sure that you push the frames tight together! Extra space between them will violate bee space and result in mis-built comb that you will have to fix later. Avoid perfumed or sweet scented products on your self or clothes – especially banana scent (or actual banana) which mimics honey bee alarm pheromone. Avoid opening hives in the dark or dusky conditions – bees can be very protective under those conditions. Try to do inspections during the middle of the day on a day when lots of bees are flying. Stand in back of or to the side of hives – out of the main flight path. Keep a camera or cell phone handy to take pictures of any thing that you find interesting or puzzling – don’t zip it up inside your bee suit!. Learn to use a smoker – and keep it lit – proper use of smoke causes less stress than trying to inspect without smoke. First year hives are generally somewhat gentle so take advantage of that fact by learning to work with them before they get too big. If your bees are mean – constantly butting, chasing or trying to sting you even when you use smoke and aren’t doing anything wrong – you need to requeen. Any bees will sting, but it doesn’t have to be like that. Worker comb – Obviously is the comb that worker bees are raised in. Most of the comb in the brood nest will be worker comb. Drone Comb – Drone comb is noticeably larger than worker brood – and really does look like corn pops cereal. 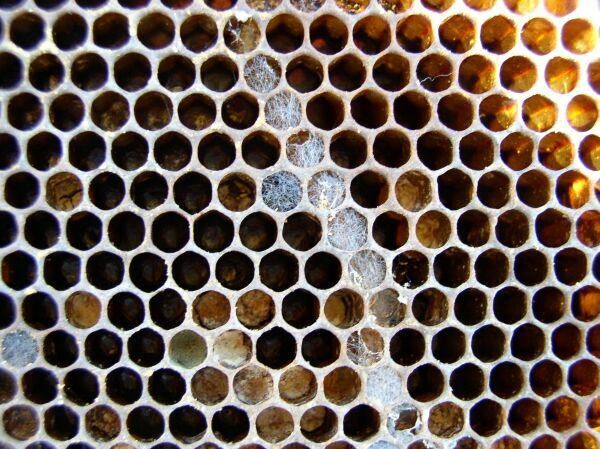 The left side of this frame (below) is capped drone brood and the right side is capped worker brood. This is not an unusually large amount of drone brood and does not indicate a failing or drone laying queen – quite the contrary, a drone brood pattern like this is typical of a healthy hive. Both kinds of brood comb will be used for honey storage when the hive needs it – and in fact there is nothing wrong with using drone comb in honey supers. Queen Cups – Queen cups are brood comb for queens – Queen cups are very different from other brood comb in that they are much larger and that they point downwards. The natural, normal way for a colony to raise a new queen is for the workers to first build a cup and then for the queen to lay an egg in the cup which the nurse bees will raise to become a queen. However any healthy hive will build cups even when they do not plan to swarm or supercede their existing queen. Try not to panic when you find them. In the event that a hive loses its queen (such as by beekeeper error) the nurse bees will convert an existing worker comb (with an appropriately young larva already growing in it) into a queen cell by first filling it with royal jelly to float the larva out and then they will remodel the emergency queen cell to point down like a normal one. In this kind of event they can not use a cup because they do not move eggs or larva around – ever. Queen cups are just brood comb – for queen brood – until a queen lays an egg in it. Cups are built most often in the spring time but most of the time they are nothing to worry about. Almost all healthy hives build queen cups, but most of them never get an egg. Swarmy hives most often build queen cells on the bottoms of frames like the ones in this picture. Once a queen lays an egg in a cup it becomes a cell and will be fully developed like this one in about a week. Queen cells built in the middle of the frame like this one are often supercedure cells – intended to replace a failing or old queen. Hives which have been established by swarms often supercede the old swarm queen soon. If you look inside a queen cup and this is what you see, then the hive is either preparing to swarm or supercede the queen. If here are no eggs or larva inside of your cups then there is no need to worry. Yet. A honey bee super organism – or colony – has the same basic needs and drives as any other organism except that it is made up of as many as 60,000 individual bees. In late winter and spring a hive will begin to produce large amounts of brood in preparation for swarming. A new colony is born when an existing colony – which usually lives in a cavity such as a hollow tree in or near a forest – issues a swarm. Preparation for swarming begins in late winter through spring when brood production and hive population increases and pollen and nectar become plentiful because of the blooming of trees and other flowering plants. Healthy colonies in the region will also start producing drones at this time. A queen cell being cared for by worker bees. A hive which is about to swarm may contain tens of queen cells. At some point heavy brood production together with an abundant influx of nectar being brought in by the rapidly growing population of foraging bees fills the available comb space in the hive and the queen starts to run out of places to lay eggs. This causes two things to happen – The queen loses weight and regains the ability to fly, and nurse bees start building queen cells and raising new virgin queens. A swarm issuing from a managed hive. Before the new queens emerge from their cells they make a high pitched sound which we call piping. By then the hive will be choked with brood and nectar, and even though new comb might be in the process of being built (if there is space for it in the cavity) many of the adult bees in the colony will become gorged with nectar partly because there is no place to put it – but also in preparation for swarming. At about this time the old queen will leave – swarming from the hive along with most of the nectar gorged adult forager bees. Sometimes the total population can be so large at this point that a beekeeper will not even be aware that a gallon or five of bees have left his managed hive. A swarm will hang out for a while – from just a few minutes to as much as 2-3 days – like this while scouts look for a suitable nest location. The swarm will condense around the queen in a tree or bush – sometimes only a few feet from the hive and sometimes quite a distance away. Most of the bees will remain in this spot while a few others scout around for a suitable location for a new home. The swarm may stay in this location for a few minutes or as long as a day or two. This is the period of time when a swarm is usually very docile and can be caught by a beekeeper and placed into a new hive. But eventually the swarm will leave and move into a new cavity that they have chosen – apparently by a more or less democratic process believe it or not. Meanwhile, back at the old hive new virgin queens are emerging from the queen cells. Depending on the conditions the first queen to emerge may kill all of her sister queens, or several of the virgin queens can coexist for a while until each leave the hive leading individual secondary swarms to establish new colonies. In the case of a single virgin queen she will fly out alone to mate with 15 – 20 or so drones and then return to her hive to begin a life of laying eggs. A queen has only one mating event in her life which may span 2-3 days – but after that she will never mate again. Secondary “virgin swarms” will move into a different location. Back to the prime swarm which has taken up residence in a suitable cavity – In a hollow tree or the walls or attic of a house, or maybe even an empty oil drum or an old refrigerator. Bees are very adaptable when it comes to nesting locations. Whenever young bees hold honey in their bodies for a long period of time they start to produce wax. So as soon as they move into the new hive the worker bees are prepared to start building comb and storing nectar and soon the queen will start laying eggs. Often – or perhaps usually – a hive like this will supersede – replace – the old queen which swarmed with it within a few weeks of establishing a new colony. If all goes well the new colony will build up a strong population and store away enough honey during the spring nectar flow to sustain it through the summer. When the spring nectar flow ends the queen will lay far fewer eggs through the hot dry parts of the summer when there is often a dearth of nectar. During the summer dearth the foragers from strong hives will often rob weaker hives in the neighborhood. – Sometimes to the point of starvation and collapse for the weaker hives. If the hive makes it through this difficult period – perhaps by robbing it’s weaker neighbors – egg production will increase a great deal beginning in late summer through early fall until frost. The bees which are produced during this period will be the ones which take the hive through the winter. In order to survive the coming winter a colony must have a sufficient population of bees to form a viable cluster – anywhere from the size of a large grapefruit to perhaps as large as a basketball. The colony also must have sufficient food stored away to feed the cluster of bees, and to begin producing brood until forage and weather suitable for foraging become available again in late winter or spring. If there is not good forage available in either the spring or fall seasons they may fall short on either or both of these goals. By late fall the hive will be completely broodless, and when the weather starts to get cold the bees will form a tight cluster – usually near the bottom of the hive with honey stored over head. The cluster of bees will maintain an internal temperature of about 94 degrees F as long as the cluster remains large enough and has food available. As winter progresses and food is consumed the cluster will usually move upward within the hive. The number of bees in the colony will go down for much of the winter – until pollen and nectar forage become available and weather permits the bees to go out and get it. Around mid-January the queen will start laying eggs again in the center of the cluster. After the hive starts producing brood the cluster will stay on it to keep it warm, and can only access the food that can be reached without moving off of the brood. If the weather remains cold long enough, and the immediately available food is used up all of the bees in the hive may starve with plenty of food only 2-3 inches away. Starvation is especially common in mid spring when large amounts of brood require lots of food and late cold spells are not unusual – a hive can starve to death in just a few days, even when lots of nectar producing flowers are in bloom if the weather is not fair enough for them to get out and forage. But if the hive makes it through the fickle weather of spring then soon enough it will probably be preparing to issue a swarm – Thus completing the cycle.